I want to say from the outset that Felix is fine now, absolutely fine, no harm done. None at all. Really. Every now and then I get a little above myself (a little? I hear my friends chorus) and begin thinking I’m supermum. This delusion seems to stem from times when I have a lot of children around me – and seem to keep them bowling on somehow – and also from times when I bake lots of cakes. Never did I think myself more superhuman than at the great 9-year-old sleepover, when we painted mugs, made and decorated fairy cakes, and- piece de resistance- had home made pancakes for breakfast. The girls thought I was a Goddess, and I agreed with them. Since then, I have brought out the pancake thing again and again, generally to universal acclaim. A vat of maple syrup(expensive stuff, but cheaper from COSTCO) sits in the cupboard. Fresh lemons always grace my fruitbowl. But my son has, of late, been viewing me with wary suspicion. The last time I made pancakes I was reluctant to throw away some home made pancake mix which had been sitting in the fridge. I wrestled with myself, did the sums, and came to the conclusion that it would still be fine to consume. I fried a textbook golden pancake and proffered it smugly up for consumption. My son’s gag reflex is famous. Once upon a time when he was younger, he tasted a slice of a huge birthday cake, made by a catering company for my birthday at great expense. It was stuffed with butter icing which must have tasted wrong to him. In front of a packed room of aunts, uncles, grannies and bemused friends and acquaintances, he gagged theatrically and shot at about 40 miles an hour into the downstairs cloakroom. The august gathering waited politely as sicky sounds quickly dampened their ardour for the remaining cake. There was a lot left at the end of the party. And I tasted it, it was fine. Bringing you back to the breakfast room and virtually the present day, shall I just say we had a repeat performance. And when I sampled it I knew precisely why. If you have ever had sour pancake you’ll know exactly what I mean. This morning at breakfast I took different, freshly made pancake mix out of the fridge, declaring loudly and publicly that it had only been made the day before. It was delicious, I added. The dog looked very impressed. My son looked sceptical as only a seven year old can. However, he’s an obedient soul at heart. I sprayed the pan liberally (I use that wonderful spray olive oil, works a treat on pancakes) and went on to cook this morning’s offering. It did occur to me that the pancake was not quite the golden shade it should be: and that a strong smell of detergent was wafting across my nostrils, and I couldn’t work out where it was coming from. But I completed a respectable-looking offering, and handed it over. My son prepared it meticulously, squeezing a quarter of fresh lemon over it, sprinkling a little sugar artistically here and there. One mouthful, that’s all it took: he spat it out and did a great impression of a bullet coming out of a gun, swiftly closing the gap between himself and the little boys’ room. Sicky sounds, yada yada yada. But what had gone wrong? The mix was fresh. I tasted Felix’s pancake to see what all the fuss was about. I had to admit something was wrong. It tasted of washing up liquid. As I stood reviewing the incident later, the jigsaw pieces finally fell into place. Next to the spray olive oil was standing another bottle. 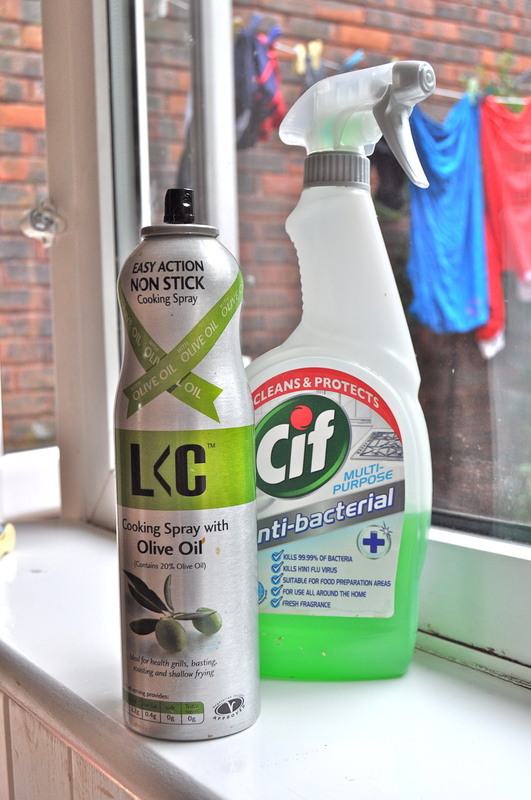 This one, however, was a bottle of spray Cif . Clearly I did not pick up the oil. I must have cooked Felix’s pancake lovingly in Cif. But as I say, he’s fine…. We now have an agreement very similar to the one Henry VIII had with a very special servant. From now on, I am to taste a small piece of pancake before it ever reaches my son’s lips. Either that or keep the Cif in the cupboard beneath the kitchen sink. Or maybe in the garage? I don’t want to mistake the tube of Veet for the tube of Colgate when I brush my teeth. No Dig, that would be equally undesirable, if not more so.